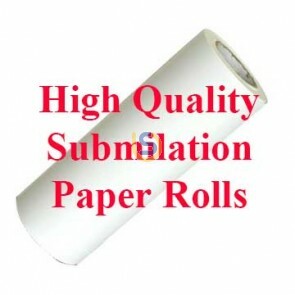 Sublimation Paper is suitable for Polyester or Poly/Cotton Mixed shirts. Please use a Sublimation Printer to print on this paper. This Standard paper is instance dry and does not have issues of teeth marks and curved edge. It is also suitable for both Epson and Ricoh/Sawgrass printers. High Release paper release more ink onto the end products so you will get a better result and less time to transfer. However, it might leave printer wheel marks on the print, you also need to let it dry before printing. So compare to the standard paper, it is a bit harder to use but you get a better result specially on fabric products such as mouse pads, sublimation t-shirts and some other thinner coating products. Standard paper is all-purpose paper, good for all products. However, it release less ink so on fabric and thinner coating products, you might get faded print. It is good at printing hard surface products such as mugs because if you compare the result with high release paper, you won't notice much different. Please select the paper type and size from below to order the right paper that suit you. 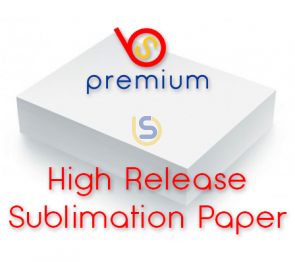 This High Release Sublimation paper is quick dry paper. It is suitable for Epson printers. Our Premium High Release Sublimation paper is quick dry and no curve paper. It gives you max printing quality while easy to use.